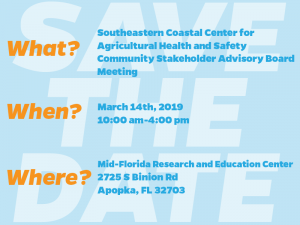 The Southeastern Coastal Center for Agricultural Health and Safety’s Community Stakeholder Advisory Board will meet to provide feedback on the future of the center. The annual board meeting will be March 14, 2019 at the UF/IFAS Mid-Florida Research and Education Center in Apopka, Florida. Travel, including lodging, mileage and tolls, will be reimbursed for CSAB members. Please RSVP for the meeting.